The NY Times is doing something they haven't done in the past. 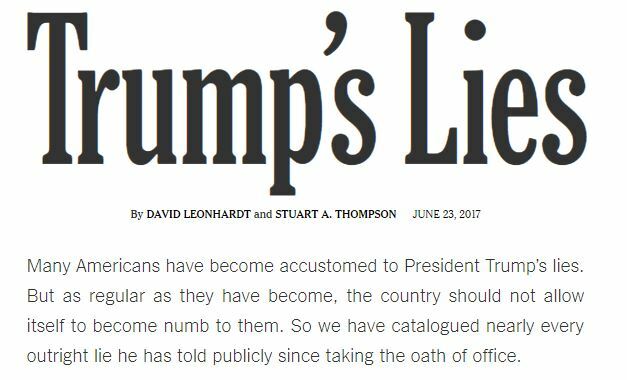 They are listing the very public and deliberate lies of a sitting U.S.President. ... We are using the word “lie” deliberately. Not every falsehood is deliberate on Trump's part. But it would be the height of naïveté to imagine he is merely making honest mistakes. He is lying. As you can imagine, the list is long. It also goes far beyond the occasional fib or misrepresentation (intentional or not) of facts that happens to every president, politician and, yes, even the rest of us. Put another way, the NY Times is listing lies that are so deliberate and natural that they have become like the air Donald Trump breathes. If the list below is difficult to read, you can click here for the NY Times article, and an explanation of their methods for classifying Trump's lies. The Bakersfield Californian's Jose Gaspar published a profile of my friend, and local political legend, Dr. Ray Gonzales. Up until last spring, when health issues began to take their toll, Dr. Gonzales taught courses in our Department of Political Science, and served as a Trustee on the Bakersfield City School District. The Californian's profile is attached below. 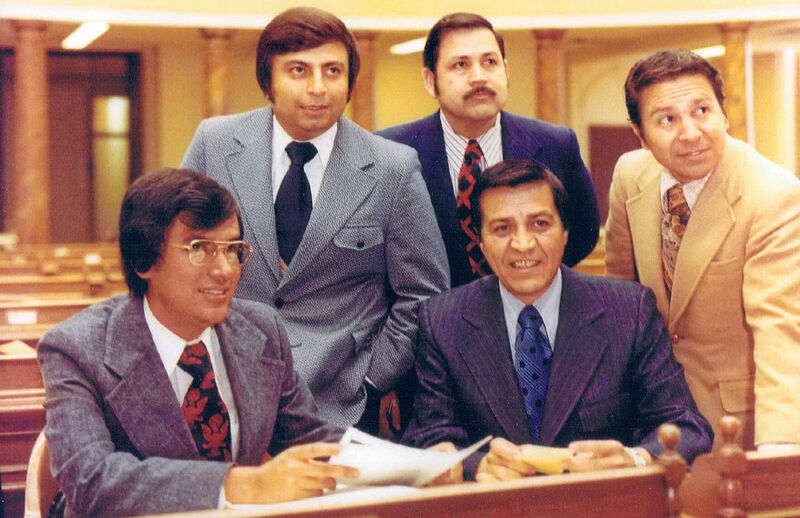 Dr. Ray Gonzales (Top Right), with his State Assembly Chicano Caucus colleagues, 1973. A more recent photo. Dr. Ray Gonzales, with Dolores Huerta, and my son, Sebastian, last month. 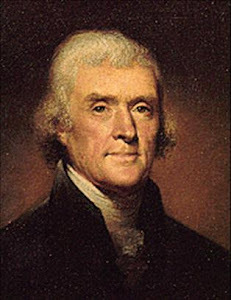 There are historical living figures in Kern County that sadly, many don't know about or have forgotten. Ray Gonzales is one of them. Gonzales recently had to step down as a member of the Bakersfield City School District board of trustees, a role he took on two years ago at the tender age of 76. That number is not a typo. So when I heard the news he was calling it quits, I knew it wasn't good news as this man has never shied away from hard work or controversy. Born and bred in east Bakersfield in a humble house on Citrus Drive, his childhood story could be that of any other raised by immigrant parents from Mexico. 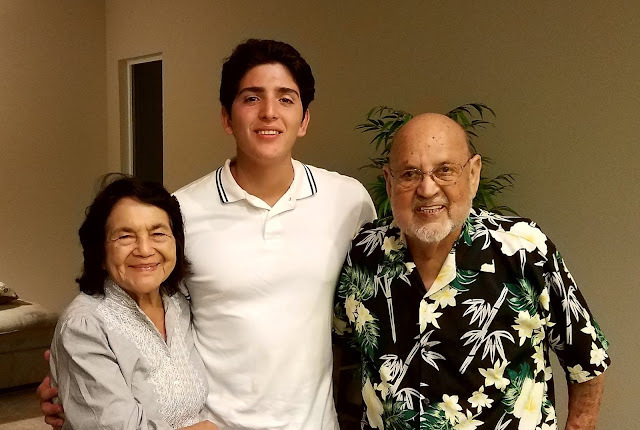 Perhaps it was this humble beginning in life that motivated Gonzales to fight for social justice by studying for the priesthood at a seminary in Michigan. "I always said I was going to be a father one way or the other," said Gonzales. The ex-Marine left the seminary but the drive for equality for his fellow man did not diminish. In fact it only grew when he acquired his most potent weapon: a college education. And a Ph.D. at that. Armed with brains, great communications skills and a drive to shake up the political establishment, Gonzales accomplished the unthinkable in 1972. He was elected to the state Assembly as the representative from the-then 28th District, becoming the first Latino from the San Joaquin Valley to win a seat. He did it by first winning the Democratic primary and then beating the Republican establishment incumbent, Kent Stacey. Remember, this was 1972, when Hispanics comprised just a small percentage of the vote. Gonzales was able to garner a coalition of white, black and Hispanic activists who yearned for change. In his book, "The Chicano Movement: perspectives from the 21st century," Bakersfield College professor Oliver Rosales wrote, "Gonzales' political approach was complex, ahead of its time, and symbolized the efforts of the liberal left in Kern County in the early 1970s." It was a historic accomplishment because four other Hispanics were also elected to the state Assembly that year, and the five of them formed the Chicano Caucus, paving the way for others to follow. Republicans however, quickly retaliated in the next election in 1974. Gonzales lost to some guy named Bill Thomas. Prior to his stint in the Assembly, Gonzales did something that literally changed the face of local television news. 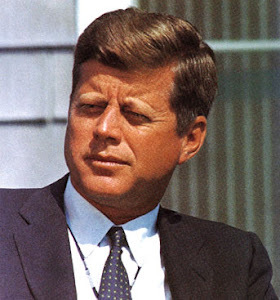 In 1967 he lead a community coalition, Kern Council for Civic Unity, and challenged the sale of KERO Channel 23. The station was among a group of others nationwide owned by Time-Life being sold to McGraw Hill. KCCU objected to the sale before the Federal Communications Commission, claiming the stations had no minority representation on its newscasts. Anchors and reporters were all white men. Women, blacks and Hispanics were nowhere to be seen. "The minorities they hired were either secretaries or janitorial people," said Gonzales. After months of wrangling, McGraw Hill agreed to hire minorities and produce community coverage. To be fair, at the time neither KBAK nor KGET had any minorities on their staffs. Other media took notice of the challenge and change would sooner or later begin happening. A direct beneficiary of this challenge was a young ex-soldier fresh out of broadcast school in Los Angeles. Working at a radio station in Lancaster at the time for $2 an hour, Louie Vega heard about a reporter opening at KERO, and gave it a shot. He was hired in 1971 and left in 1977. Kern County had its first brown face on local television news. "I was the first to break that barrier, others soon followed," said Vega. But with people like Vega on the air, there was talk that some advertisers were threatening to take their business elsewhere, said Vega. The experience served Vega well. He went on to law school, became an attorney and in 1990 he was appointed as a court commissioner by the then-Bakersfield Municipal Court judges. Today, Vega serves as a Kern County judge, having been appointed to the bench in 2008 by then-Gov. Arnold Schwarzenegger. For all this, he thanks Ray Gonzales. "He's a great man, great intellect and dedicated," said the judge. "He's made this community a better community." Not only this community, but he also served his country well as part of the Diplomatic Corps for 10 years serving in numerous countries including Guatemala. It was here in the 1980s when he and his family were on a hit list issued by right-wing death squads. Later he served three years in Brussels where he rubbed elbows with royalty. The only thing that has stopped this educator and civil rights pioneer is his health. Battling diabetes, his kidneys are failing and he's on hemodialysis. He will most likely be leaving town and moving to the coast to live with his daughter. I asked him how a kid from humble beginnings wound up doing so much. "I always tell young people that if I, a mexicanito (little Mexican) out of east Bakersfield, can accomplish what I did, then they can do it, too." 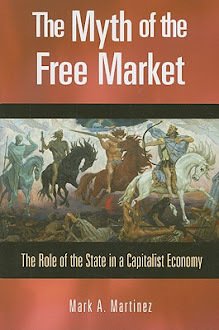 For the record, beginning in 2014 Dr. Gonzales began writing and sharing some of his thoughts with readers on my blog. 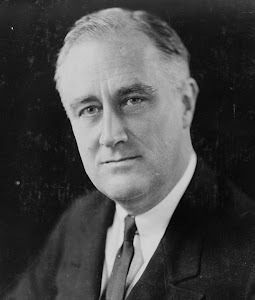 His most popular posts on my blog were "Reagan Supported Health Coverage for All" (which detailed the story behind health legislation Dr. Gonzales sponsored, and Gov. Reagan signed) and "Donald Trump Embodies the Dark Side of American Exceptionalism." My personal favorite was "Ambassador Stevens' Actions in Benghazi, Not Only Careless but Reckless." In all cases, kudos to Jose Gaspar and the Californian for bringing attention to Dr. Gonzales' incredible life history. 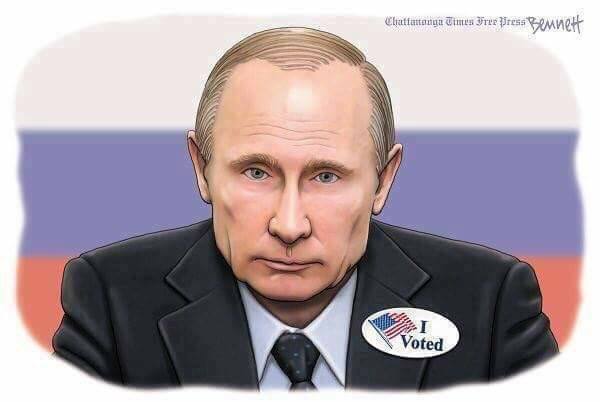 Donald Trump is president because of Russian interference. Every national intelligence agency in America is in agreement on the issue of Russia's interference in our presidential election. Incredibly, Trump's supporters don't care. This is the condition of democracy in America in 2017. To help explain how this happened, and what the Obama administration tried (and failed) to do about the interference, the Washington Post has this article on Russia's efforts to undermine America's presidential election in 2017. In the article we learn that Russia's twin election goal was to undermine Hillary Clinton's electoral chances, while simultaneously undermining America's confidence in its political system. Russia's dream outcome was to get Donald Trump elected president. 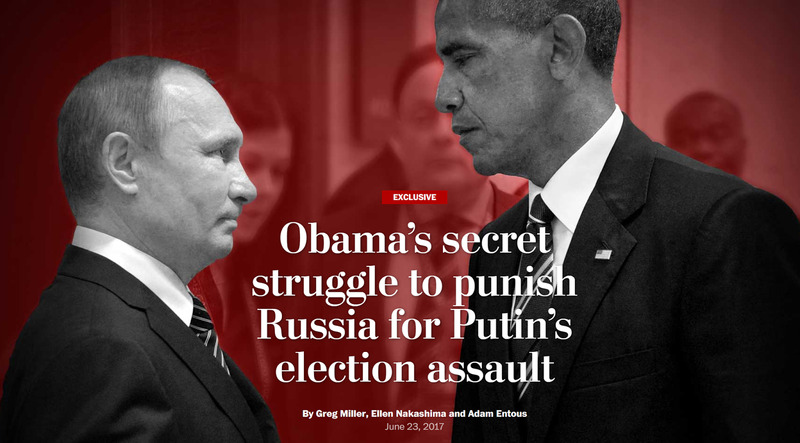 You can finish reading "Obama's Secret Struggle to Punish Russia for Putin's Election Assault" by clicking here. The Republican Party is working feverishly to put together a "tax cut for the rich" bill that they're ridiculously calling a health care bill. The GOP has lied to themselves, and others, so many times about why their bill is better than Obamacare (it's not) they don't even want to debate the bill in Congress before a vote is taken. To avoid a discussion on the bill they are grandstanding. They're trying to suggest that hiding in the dark, while crafting legislation, is "normal" behavior for the U.S. Congress. Normal Americans see it for the drama soaked red herring it really is. Republicans are even going as far as saying something's wrong with the rest of us for not understanding all the good they're trying to do. What's worse, is their base believes them, which helps pit one part of America (Republicans and conservatives) against others (Democrats, liberals and those who want healthcare). Without understanding what's at stake, an "us" versus" them mentality has taken hold in our health care debate (and in America). Worse, the GOP wants to blame Democrats and others for not understanding why their tax cuts for the rich bill is really a (very bad) health care bill; as if we're to blame for not believing the lie. I'm bringing this up because - via "Health, Spirit, Body" - we get the "5 Undeniable Signs That You Are Arguing With a Sociopath," which essentially outlines the behavior embraced by our modern Republican Party's leadership. 1. Pathological Lying: It's not a health care bill, it's a tax cut. 2. Drama Fatigue: Since there is no shame in lying (at least for them), the GOP's outrageous claims/demands exhaust you until they become "normal," so you begin to ignore them. 3. Gaslighting: Lies and denials (of the lies) until confusion reigns. 4. Polarizing Behavior: Create divisions in society; it's divide and conquer those who might otherwise be allies. 5. Provocation: Force a reaction, from you, then blame you for reacting. There's more on what makes a sociopath, which you can access by clicking here or here. 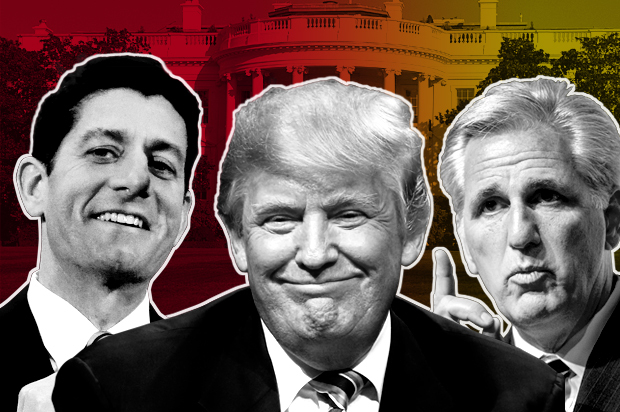 For a discussion on the Republicans, the healthcare bill, and sociopaths, click here. For a discussion on Trump and the behavior, click here. Kudos to Cheryl for the "5 Undeniable Signs ..." article. It was a big day for President Trump. He found out that he is now personally under investigation for obstruction of justice. But rather than talk about this, as Seth Meyers points out below, President Trump wanted to talk about a Senate Republican healthcare bill the GOP is secretly working on; which means it doesn't have any input from the Democrats and, not coincidentally, no input from the public. Yesterday President Trump tried to claim that the United States built the Golden Gate Bridge in four years, and the Hoover Dam in five. He was trying to make the point that pesky permits, local community standards, and government regulations today are stalling projects in a way that we didn't have to deal with 80-100 years ago. This is an interesting story line, except for one thing. It's not true. 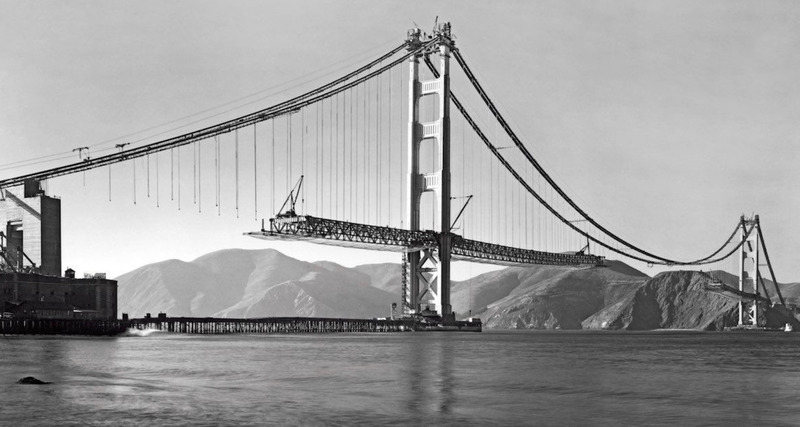 As the Washington Post points out, from concept to proposal (1921), the Golden Gate Bridge took at least 16 years to be completed. 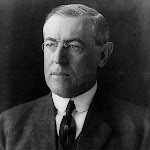 Local communities, ferry operators (who feared the competition), the War Department, and the need to create a special tax district (to pay for the project) all contributed to delays, which prevented the actual project from starting until 1933. So, yeah, President Trump doesn't know what he's talking about when it comes to the Golden Gate Bridge. Worse, to make a non-existent point - there were few to no regulations, or obstacles on the project - Trump lied about the facts surrounding a major policy issue, again. When it comes to the Hoover Dam, if you count the 1902 Reclamation Act - which put the Hoover Dam on our infrastructure radar - the project (originally called the Boulder Dam) took 34 years. 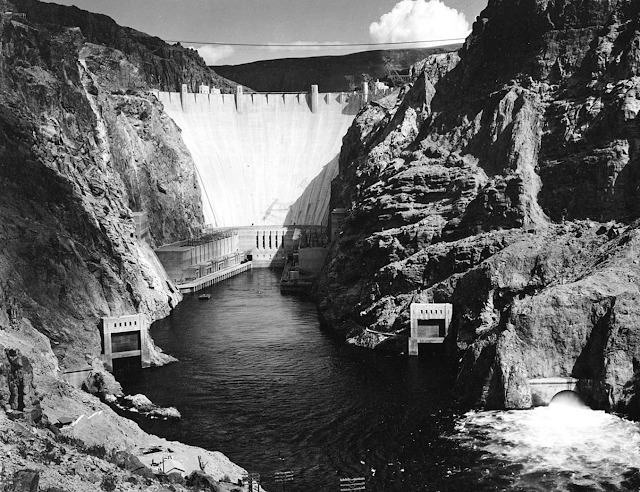 Stalled by a lack of funds, changing designs, construction restrictions, and the need to build supportive infrastructure projects (including a small town, Boulder City, NV), among other developments, building the Hoover Dam took far more than the five years that President Trump claimed it took. So, yeah, President Trump doesn't know what he's talking about when it comes to the Hoover Dam. 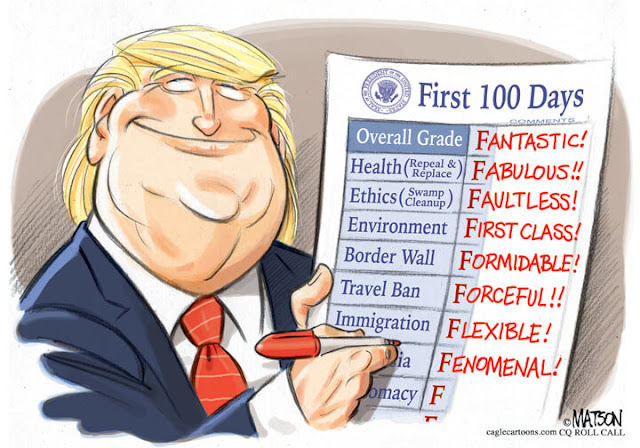 Worse, to make a non-existent point - there were few to no regulations, or obstacles on the project - Trump lied about the facts surrounding a major policy issue, again. Here's the point that we need to keep in mind. President Trump is a professional liar. Worse, he thinks everyone in America is just as gullible or as intellectually stunted as his supporters.